Has the Royal Society abandoned science? (there are at least 4 such meaningless diagrams) but contains virtually no science. In the introduction, Paul Nurse claims that “By presenting evidence of trends in extreme weather and the different ways resilience can be built to it, we hope this report will galvanise action by local and national governments…”. But unfortunately Nurse and his chums seem to have forgotten to include any evidence of trends in extreme weather. All we get is examples and anecdotes. Throughout the entire 100+ page report, there is not a single graph showing past trends in extreme events (there are plenty showing the results of speculative computer models for the future). Graphs of UK rainfall are often shown at Paul Homewood’s blog, for example in his recent post Rainfall Patterns In The South West, relevant to the Somerset flooding, where it can be seen that there is no trend in rainfall and the wettest month occurred in 1929. I wonder why no such graphs are shown in the Royal Society report? Hurricane Sandy is mentioned several times in the report, but there is no mention of the current record-breaking lull in hurricane activity. 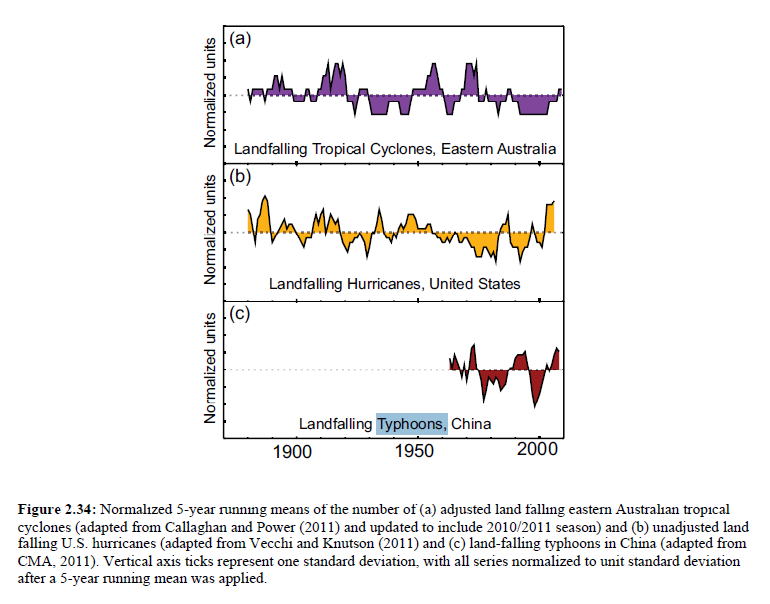 Tucked away in the middle of the report are the distinctly un-alarming remarks from the IPCC SREX (2012), such as “Low confidence that anthropogenic warming has affected the magnitude or frequency of floods at a global scale”. Roger Pielke has a useful summary of what the IPCC AR5 had to say about extreme events. He ends with “Of course, I have no doubts that claims will still be made associating floods, drought, hurricanes and tornadoes with human-caused climate change — Zombie science…” I wonder what he would make of this report by the Royal Society? On P.109 of the report we are told that it was reviewed by a panel of eight experts before being accepted by the Royal Society. So it is curious that amateur blogger Andrew Montford managed to find a basic error in it so quickly. Maybe they should employ him in future to check their reports for errors? Today is the 5th anniversary of the start of the ‘Climategate’ incident. Here’s a brief summary of what happened, plus IPCC-related issues raised and some thoughts on how it affected the opinion of scientists and the public. This included about 5000 emails, plus an encrypted file containing over 200000 emails. A third announcement was made in March 2013. This said that the person who hacked/leaked the emails acted alone, without any oill funding or political support, and hints at a past academic career. Climate scientists Heinz Wanner says that he was a reviewer of the IPCC TAR (2001) and criticised it’s extensive use of the Mann Hockey Stick picture, but his comments were ignored. Contrary to the nonsense on the subject in the Wikipedia article, Climategate had an impact on the opinion of both scientists and the general public. Climate scientist Judith Curry described in an interview how “Climategate and the weak response of the IPCC and other scientists triggered a massive re-examination of my support of the IPCC, and made me look at the science much more sceptically”. Berkeley physicist Richard Muller discusses the notorious “hide the decline” graph here, saying that you don’t do this and that there’s now a group of scientists whose work he doesn’t trust. At a meeting in Nottingham, Physicist Philip Moriarty said that he and colleagues were shocked by Climategate, and used the word “anathema” in relation to the withholding of data. Mike Hulme wrote an interesting essay After Climategate … Never the Same in which he discusses the impact on science and scientists. He also notes the impact on the opinion of Guardian writer George Monbiot (who called for Phil Jones to resign) and the general public, saying that a survey soon after the event showed a significant decline in concern about climate change and public trust in climate science. A paper by Leiserowitz et al, “Climategate, Public Opinion, and the Loss of Trust” found a significant decline in Americans’ climate change beliefs between 2008 and 2010 (from 57% saying human activity was causing warming to 47%). They also asked specific questions about climategate, to confirm that this was a significant factor. Other papers on Climategate include Reiner Grundmann’s “Climategate” and The Scientific Ethos, which discusses the issue in relation to traditional (“Mertonian”) and more policy-linked ways of thinking about science; The legacy of climategate, by Maibach et al, who say that it increased the partisan divide in US politics; and Climate change and ‘climategate’ in online reader comments by Koteyko, Jaspal & Nerlich. Climategate did not change my own views very much, but made me more confident that my assessment that climate change is exaggerated and politicised was correct. To me, the real scandal was not so much that two or three climate scientists behaved badly, but that virtually the entire climate science community tried to pretend that nothing was wrong. 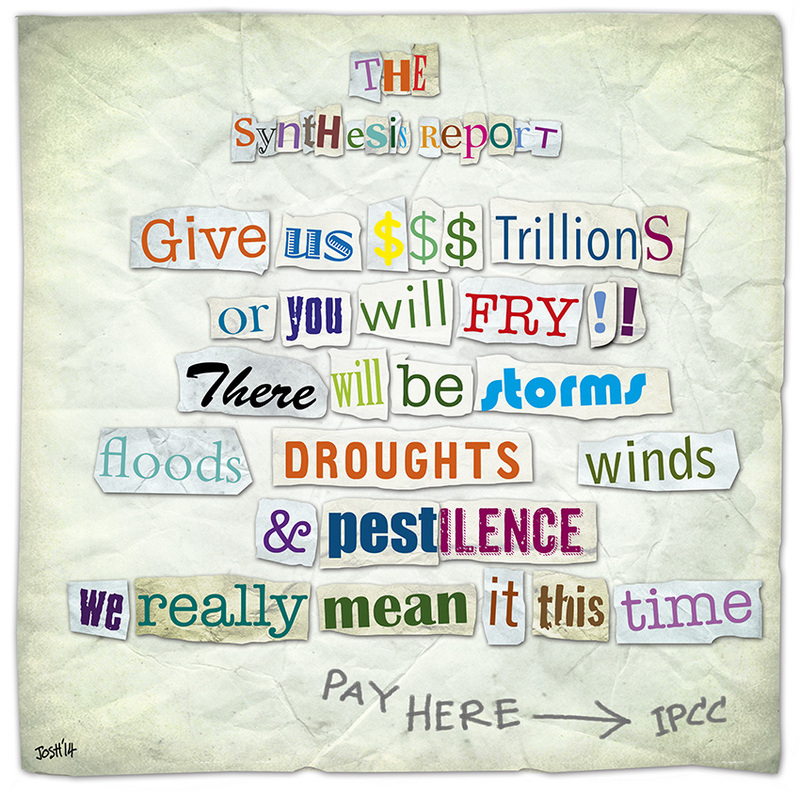 The last gasp of IPCC AR5, the Synthesis Report, was published on Sunday, Nov 2nd. There is a full report , 116 pages, and a concise 40-page Summary for Policymakers. There’s also a short press release. The idea of this report is to summarise and collate the main points from the reports of the three working groups that have already been published, so there shouldn’t really be anything new here, though there may be a change in tone or emphasis. The comments here are based on the full report. There seems to be a sequence of non sequiturs between the different sections of the report, and between the report and the way it has been reported in the media – the usual game of climate chinese whispers. The report starts well on “Topic 1”, the basic observational data. It says there has been a warming of about 0.85 [0.65-1.06] C since 1880. It acknowledges that there’s been virtually no warming over the last 15 years, and that Antarctic sea ice has increased. It says that the current rate of sea level rise is very similar to that in the early 20th century. On extreme weather events, the report claims very little. It says that warming causes warming – the number of cold days has decreased and warm days have increased, which reminds me of this quote. In a similar vein they say that heat-related deaths have increased while cold-related deaths have decreased. There is a rather tentative claim about heavy precipitation events, saying that it is likely that there have been more increases than decreases. But exactly what is a heavy precipitation event, how is it measured, and how accurately and when and where have they been measured? They say there’s ‘low confidence’ in anything to do with flooding, droughts and tropical cyclones, which ought to quieten down the Green Blob claims of storms being caused by global warming, but probably won’t. 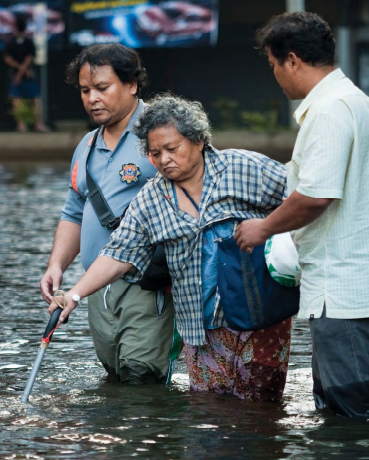 The report deteriorates sharply when it gets on to Topic 2, “Future Climate Changes, Risks and Impacts” (p 18). This starts with the bold claim that “Continued emission of greenhouse gases will cause further warming and long-lasting changes in all components of the climate system, increasing the likelihood of severe, pervasive and irreversible impacts for people and ecosystems”. No uncertainty is expressed, there’s just the word “will”. No mention is made of the fact these are projections based on speculative computer models that have completely failed to predict the slow-down in warming or the increase in Antarctic ice discussed in the previous section. There’s a prediction of 0.3-0.7C of warming over the period 2016-2035, which they say does not depend on emissions but would depend on any major volcano’s or changes in the sun’s output. The scare-quote above about “severe, pervasive, and irreversible impacts” is repeated, leading on to claims of severe ill-health, food and water insecurity, loss of ecosystems, droughts and floods, and even violent conflict. 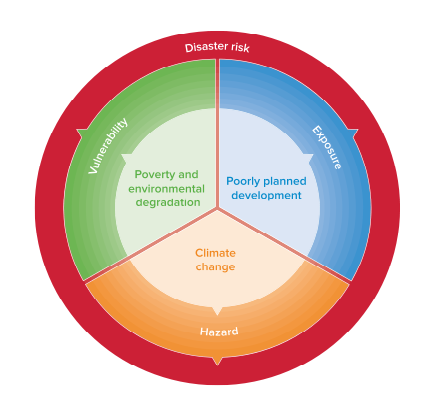 Topic 3 on adaptation and mitigation makes similar overconfident claims, repeating yet again the threat of severe impacts scare unless we undertake mitigation. Here the IPCC comes close to breaking its own guidelines, that it is “policy-relevant and yet policy-neutral, never policy-prescriptive”. This was the headline of an article on the BBC website. The IPCC said no such thing (which would have been a clear breach of their policy guidelines) – the word ‘must’ does not appear anywhere. The BBC changed the word ‘must’ to the slightly less misleading ‘should’ – possibly as a result of a tweet I sent to them. But this incorrect statement has been widely copied, for example in the Mail. The Guardian headline is “rapid carbon emission cuts vital”, with the obligatory misleading picture of white water vapour from a cooling tower back-lit to make it look black. The Independent says it’s a “final warning” and also picks up on the fossil fuel phase-out by 2100. Even the normally more reliable Emily Gosden in the Telegraph writes incorrectly that “Global emissions must fall by at least 40 per cent by 2050 and be cut to zero by the end of the century, the report from the UN’s Intergovernment Panel on Climate Change warns”. In Spiegel Online, Axel Bojanowski says the IPCC has put alarm before accuracy, citing examples where the summary is more alarmist than the main report, in particular on the danger of extinction (comments in English here). Jo Nova says the IPCC is recycling its message of doom, despite being consistently wrong. Carbon Brief reports on “What’s new and interesting in the IPCC synthesis report” – which ought to be a very short blog article. RTCC has several articles, including a summary in tweets and a claim that the report was watered down. James Delingpole summarises the IPCC message as “Buy our snake oil or the world gets it”. Marcel Crok has a blog post “IPCC bias in action”, saying that there is much less discussion of climate sensitivity than in AR4 (no mention at all in the SPM). Matt Ridley says the IPCC high emission scenario “makes wildly unrealistic assumptions” and exaggerates future warming.